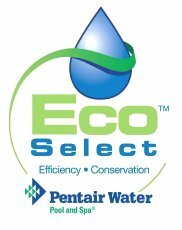 The benefits of great design can quite literally save you $1,000’s over the life of your swimming pool. A plan, can quite literally act as the most effective tool for tightening the parameters for what is to become price comparable! This is accomplished by “FULLY” describing the intentions that will anchor a stronger commitment from a potential performer. 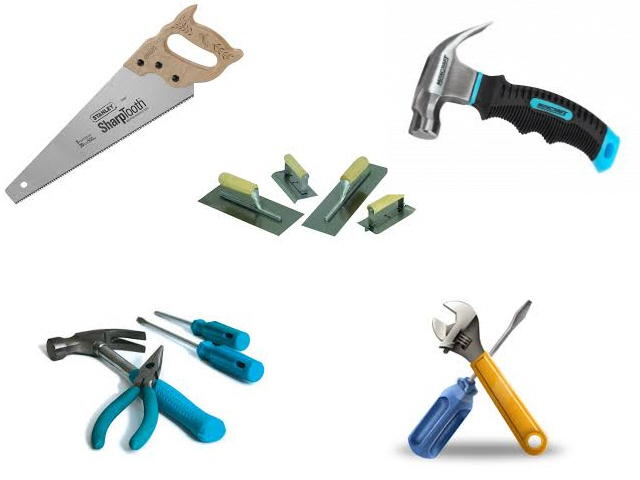 Thus, STRONG plans can tighten the assembly of nuts and bolts by forming a factual and verifiable consensus of understanding for what is to be expected for fulfilling all the requirements by the performers! 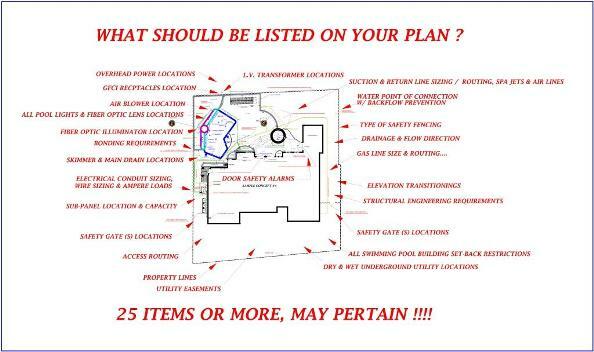 What do our plans provide you? Our design efforts began more than 40-years ago and we have constructed thousands of outdoor living environments over several decades! We apply the “HOW TO” step by step instruction for our time tested field exposure, and these directions act as a road map for arriving at successful results! In describing the A to Z nuts and bolts assemblies that will be required in building a 1st Class product on your PLAN & SPECIFICATIONS, we illustrate how our sound advice applies to providing you with the tools that are necessary for achieving the results that your investment dollars deserve. 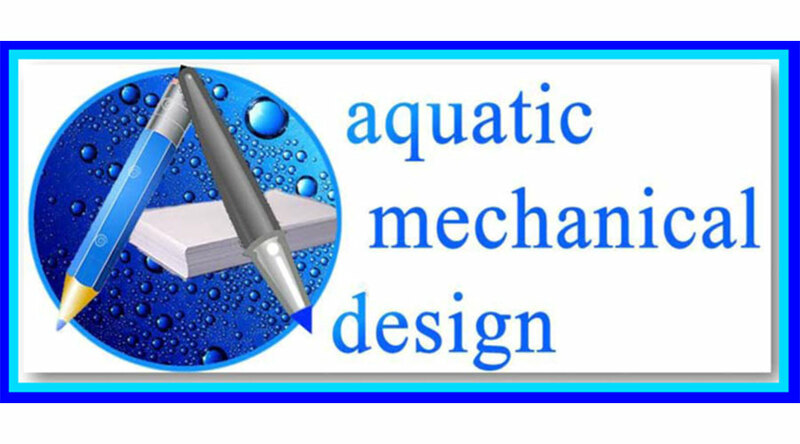 Our design understanding in anchored in an acquired substantive and measurable value, which involves not just industry recognized credentials but, also the time tested application of design intent that has spanned generations of in-field exposure. This offers our clients something well beyond just the lines on paper from a graphic design. It affords them the benefits and rewards that can have come from “been there, done that” acquiring a time tested level of both knowledge and experience! We aid the accomplishments for achieving 1st Class standards by anchoring our planned directions to rock solid CONSTRUCTION DETAILS and a strong SPECIFICATION foundation, which can then be utilized to solicit truly comparable estimates from contending bidders, apples to apples! 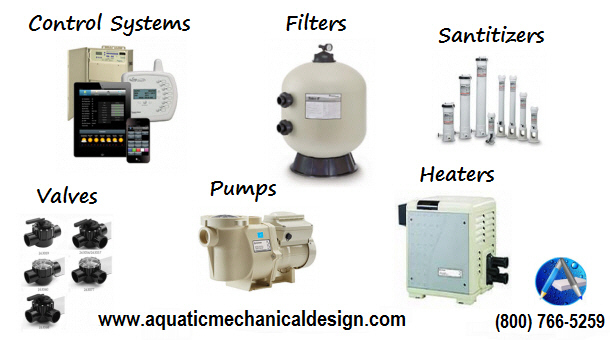 The latest sales craze is to chime in with how a VARIABLE SPEED PUMP is going to save you big energy consumption but, if the PLUMBING SYSTEM’S hydraulic design fails to be able to facilitate the pump’s delivery of the correct water flow volumes, which are required to efficiently and effectively turnover the pool’s water volume, well then,…you won’t be able to benefit from an energy conserving pool solution. The distraction for achieving truer comparisons can get lost in the fog of too much or too little information. It is important to remember that whatever doesn’t become verifiable on a plan’s intentions can often escape a meaning of responsibility in a price! Additionally, that missing information becomes the likely factor in swaying a decision to be sold on something unbelievable, rather than to buy upon factual believability! 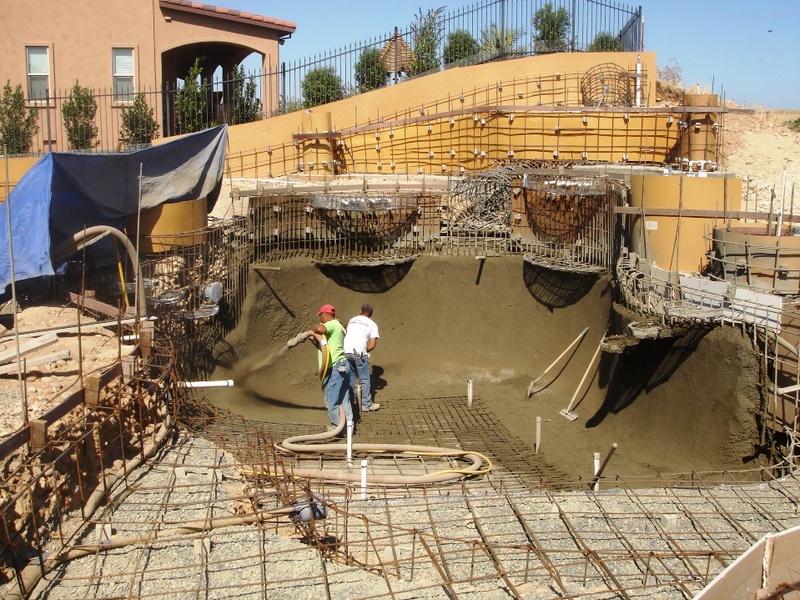 The most common approach in soliciting construction contenders for building a swimming pool or backyard living environment is to call several different contenders for the work and solicit free estimates! Actually, the 3-BID pursuit is a great “OLD SCHOOL” tool for being sold, it is not the best tool for measuring the value in a price or more importantly, relaying the differences in performance intentions between contenders! Getting everyone on the same page, first! Our accurate planning connects you to the truest meaning for the MEASURABLE VALUE in a “PRICE“. Your project can greatly benefit from having your plans exhibit all the requirements, clearly and concisely and from there, LET THE BIDDING BEGIN! Our generationally seasoned exposure to not just designing but, hands-on building can provide you with a field tested mechanism for making comparative costs evaluations. 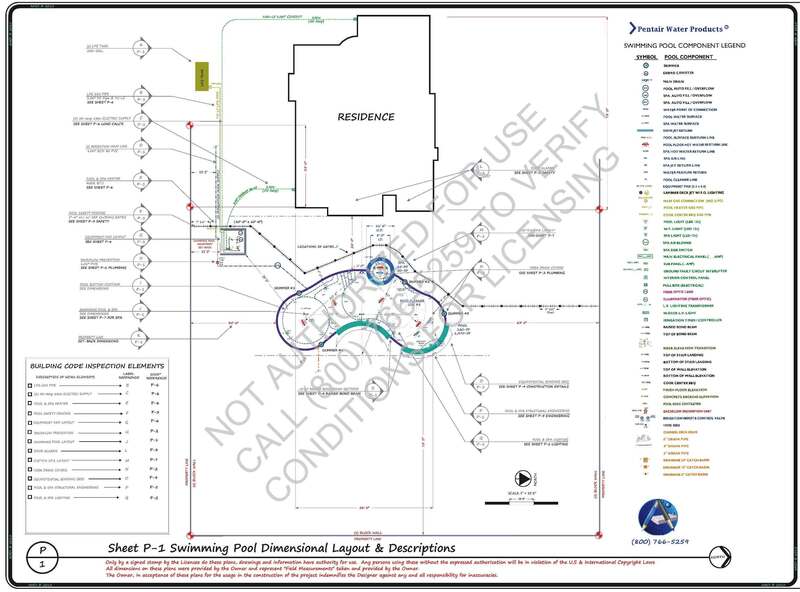 Our “PERMIT READY” design LEVEL I has a fee structure that is based upon 2% of our Estimated Retail Construction Value (ERCV) of a proposed project, plus engineering costs. This level of planning shall address the illustration and information that is directly associated with conveying a CODE COMPLIANT construction / installation intention according to the official’s specific plan check guidelines. Our OWNER / BUILDER design LEVEL II has a fee structure that shall run a little more, as the number of plan sheets will increase. 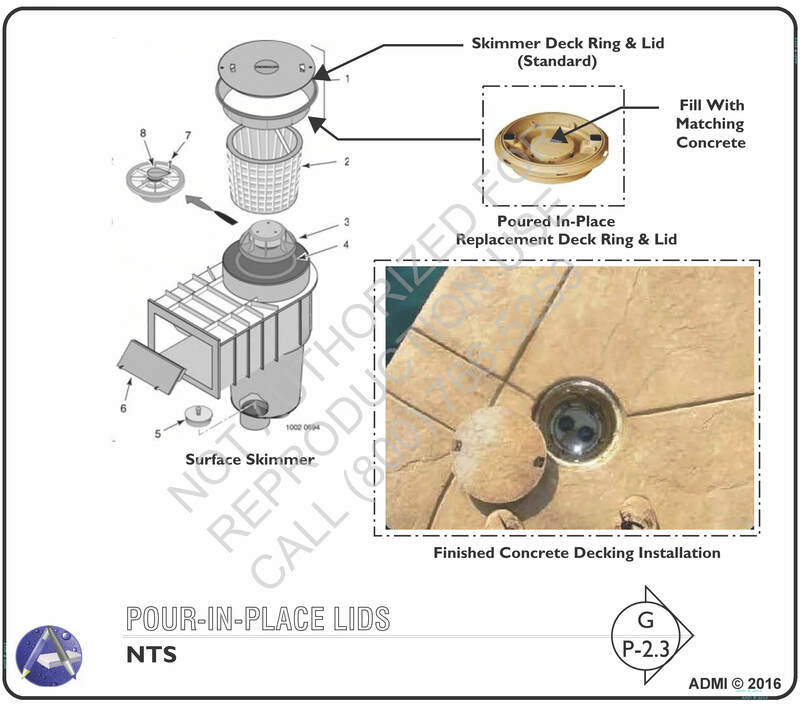 Basically, the number of planning sheets that are necessary for exhibiting what is required by officials, as well as what we may offer you for a hands-on approach to the installation procedures, Mfg.s protocols and steps to be taken for more detailed understandings. What can be expected from our designs? 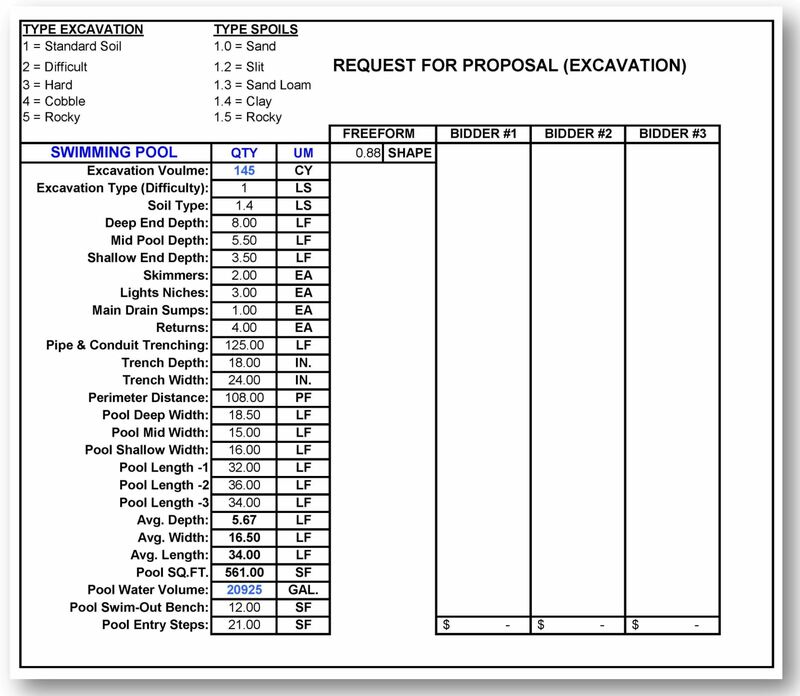 The type of information being shown on the plan below provides an example for some of the preparations that are needed to be correctly exhibited on a swimming pool plan in the submission for a Building Permit. Our planning efforts can allow an evaluation to be made from 3-separate bidders, from three different performers and from three different approaches simultaneously. We do this by establishing one commitment to one plan, your plan! Unless you are a knowledgeable expert in this field, it would be virtually impossible for you to equate the true comparative worth in results of soliciting 3-bids from three different performers for three different sets of plans. 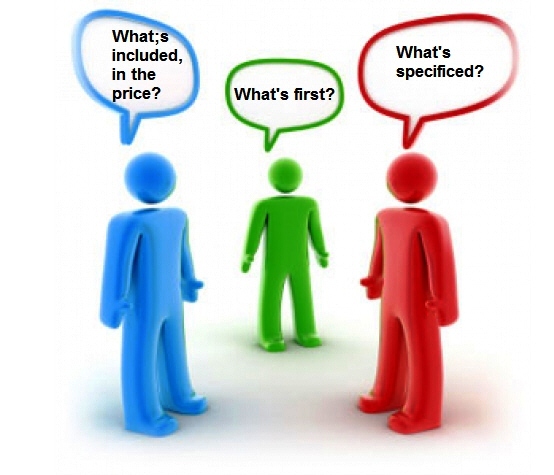 Vast differences can become applied to the installation standards, practices and manufacturers protocols, while competing on merely the appearance of a lower price! We are a resource for eliminating the kind of remorse that comes from hindsight disappointments, whereas clear and concise planning could have accomplished meeting your expectations! 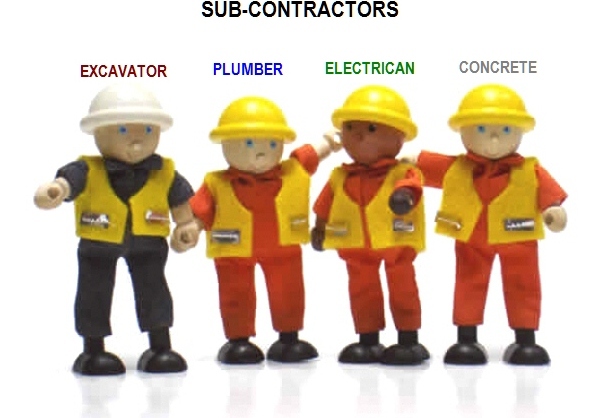 After all, what is it that you are buying, if it can’t be exhibited on a dimensionally accurate diagram, clarified on an installation detail as to the procedures for proper installation and quantified by a written specification?